Selfies are the main focus of the latest phone release from Chinese company Oppo. The Oppo F1 Plus features a 16MP front-facing camera, which offers some of the best selfie-taking abilities known to man. It also comes with a 13MP rear-facing camera, but that's put to shame by the megapixels on the front. There's a 5.5-inch 1080p display, which gives the screen 400 pixels per inch, a MediaTek MT6755 processor, 64GB of internal memory and microSD support up to 128GB. 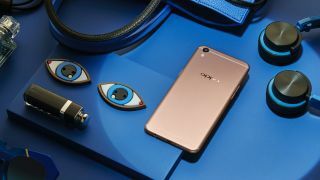 Software-wise it's a little behind the times, having Android 5.1 Lollipop onboard, but Oppo has put its Color OS 3.0 over the top to give the handset its own distinct flavour. If this setup looks familiar to you, it's because it's same phone that was released in the east under the name of the Oppo R9. The Oppo F1 Plus is coming to the UK soon, and will be sold online from £299. The phone is already available in Australia, called the R9 and priced at AU$599. Oppo has told techradar is doesn't plan to launch the Oppo F1 Plus in the US in the near future.